Classic cars, especially those that go all the way back ‘50s, ‘40s, or even ‘30s, always have a special place in our hearts. These cars are priceless treasures, as they were the foundations of automotive history and they went through a lot of stories. Simply put, if these cars can talk, we’re pretty sure they would have interesting anecdotes to quip. 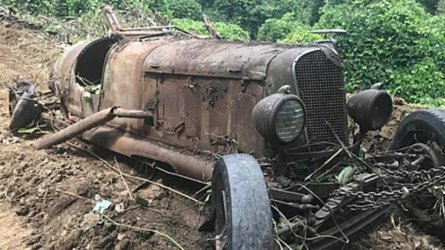 That’s why this story of abandoned old cars is a bit sentimental to us. Apparently, a man from North Carolina unearthed several pre-war classic cars when he was hired to demolish an old building and clear out the property. David Mount, a contractor, didn’t expect he’d come across these cars at work. According to the story found on Hagerty, Mount’s daughter was the one who spotted the first of the cars in a basement garage. Initially, only the grille and headlamps were visible under the pile of debris. When dug up, a 1933 Plymouth roadster was revealed. It even came with its signature suicide doors. That discovery prompted the father and daughter tandem to explore the property more, which didn’t end in vain. They were able to unearth a total of 10 cars and trucks. Among the notable finds were an unknown roadster built on a ‘30s Ford chassis and with a Flathead V8. A1939 Chevrolet Master Deluxe sedan was also found with the rubbish. Luckily, the property owner didn’t have any interest in keeping the classic vehicles for himself, so Mount and his daughter claimed the barn finds. Although, Mount pointed out that some of the cars were too distraught for salvaging, while some might have a tiny piece of hope in them. Mount’s daughter was eyeing the Plymouth roadster, by the way. Right now, two of the speedsters unearthed are still unidentified. If you recognize any of them, he highly encourage you to join this Facebook group and engage in the discussion. These cars deserve to be identified, we reckon.